enjoyment from minimum spaces. Let’s start with the “wired” folks. 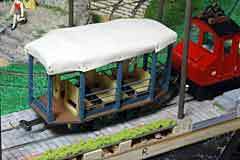 For more about layouts for trolleys and trams see Scrapbooks #54a and #58. Some excellent traction modeling websites are listed at the Wiki “Traction” page. 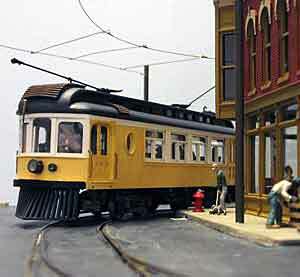 Cars shown in the photos include a kit-bashed LaBelle Ohio Electric interurban and and a Q-car GE 50 ton steeple cab. Both negotiate the sharp curves comfortably. And isn’t that downtown block delightful? Frequent-contributor Vincent Wesstein, from the Netherlands, designed this narrow shelf line to represent a small-town trolley system almost anywhere in the world. 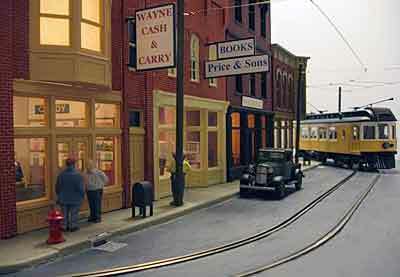 Vincent explains, “The trolleys run from downtown to a rural area outside city limits, perhaps a park or lake. The backdrop should be of city houses in low-relief (front wall with windows, but no sidewalls) progressively getting more ‘upmarket’ as they get closer to the green zone. The baseboard isn’t wide, only 15cm (6in) or so, but fairly long (about 2 meters or 6.5 feet). “The name is composed by mixing two German words, Kurve (turn or bend) and frei (free). Putting those together gets ‘bend-free’ (Kurvrei) and that’s exactly what it is, more or less! 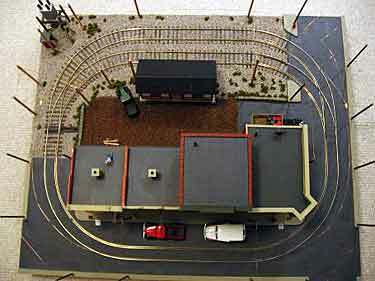 This layout offers room for automation and multiple cars running.” Vincent designed this layout for H0 scale, but almost any scale could be used. Sometimes disastor can provoke a response that, Phoenix-like, rises from the ashes and is better than ever! Dave Carson’s Routes End layout (shown at right) is a good example. 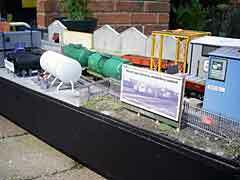 It suffered extensive damage at a train show when struck by an unruly child. “I’ve rebuilt it as Route’s End 2,” Dave explains, “with a simplified operation of both my Mehano Boeing LRVs shuttling between the rebuilt terminus and two stabling sidings. I’ve added Viessmann catenary which really looks the part! Despite the Boeing LRV’s running on the layout, I themed this layout as ‘it could be anywhere in the English-speaking world’! 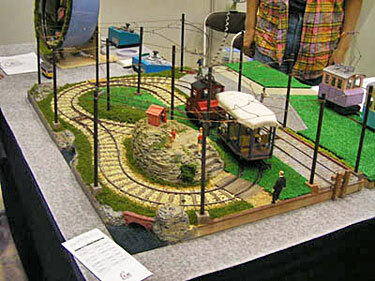 “The layout is much easier to operate as I’ve eliminated over-reaching for the Loco-Lift and now have time to converse and interact with viewers at shows.” Dave sent along the photo at lower right to show that there’s a prototype for any operation you can dream up on a model layout, including the trams’ movements on Routes End 2! 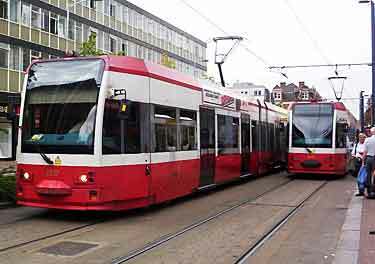 “The photo shows Croydon Tramlink 2537 and 2547 at George Street during engineering works. In 2007 Croydon Tramlink operated in two halves during track renewals. George Street (East Croydon) became a temporary stabling and reversing sidings. In the photo, Car 2537 (left) is about to re-enter service and Car 2547 (right) is stabled as a service spare.” (Croydon is a large town and major commercial centre in South London.) Dave lives in Stowmarket, Suffolk, England. His layout is HO scale, 42x7in (107x18cm). 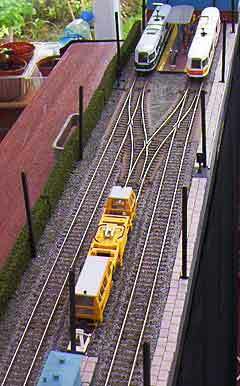 SECTIONAL TRACK FOR O-SCALE TRAMS AND TROLLEYS! 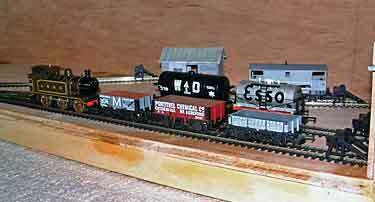 From Sydney, Australia, Martin “Mad Marty” Hartley sent a layout design based on the ETS system of two-rail O scale trains and track. 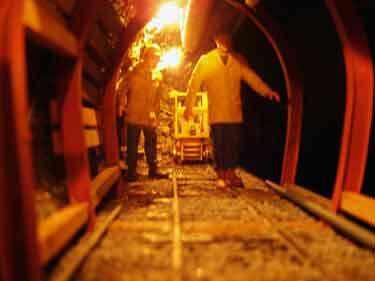 ETS have been making 1:45 scale tinplate-style trains since 1992 in the Czech Republic. Using the ETS trolley car and tight-radius trackage, Martin managed to fit a continuous-circuit traction layout into a micro-layout space (3660 sq. cm)! Over-all dimensions are 91x45cm (36x18in), and by rounding the ends of the baseboard Martin brought it in under the four-square-foot micro mark. “The layout as drawn is designed as a small depot/facility which could be for goods handling or trolley servicing,” Martin explained. “The main circuit is ETS tramway track (with the exception of one long section behind the back scene), and the sidings in the yard are plain railway-style track. The blue line on the plan signifies a back scene to help increase the illusion of connection with a larger system. 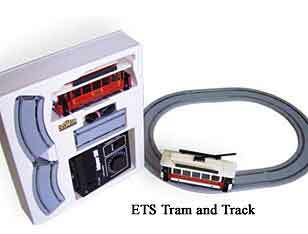 The ETS range includes catenary to suit the trolleys for that really authentic final piece of detailing. “The staging track is probably just long enough to fit two trolleys or a trolley and short trailer. The large tinplate lithographed models are sturdy enough to be manually taken on and off the staging track — after all, they were designed to be played with! I doubt that any larger motive power will survive the 17 cm (6.7in) curves! ETS also makes their four-wheel mechanisms available seperately for scratch-builders and kit-bashers, which enlarges the possibilities.” Martin has showed it’s possible to have an operating micro layout in two-rail O scale traction! Also intrigued by the possibiliies of the ETS track system, I used it to design a 4x4ft (120x120cm) O-scale version of the entire Nelson Electric Tramway system in British Columbia, as described by Brian Wilson in Scrapbook #66a. 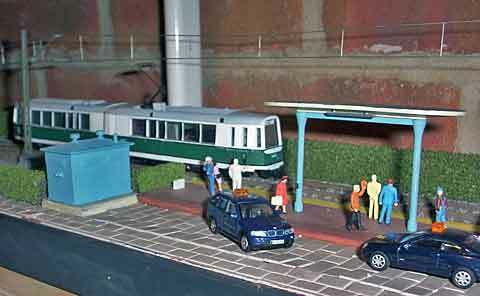 The photo at right shows my mockup of the scene at the NET car barn — though I don’t know whether the Bowser Brill trolley could make it around those under-seven-inch curves! Some fiddlling with the bogie (truck) swing may be required. 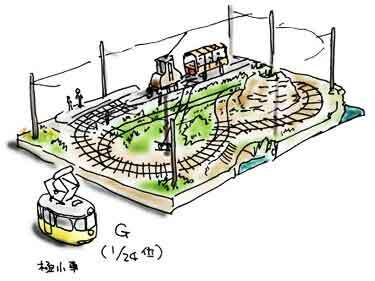 Koike Noriyuki (nicknamed Rehsi), from Japan, has created some sort of ultimate micro operating layout in G scale (1:24 running on 45mm/1¾in gauge). His 900x600mm (3x2ft) layout was exhibited last summer at JAM, the 8th International Railroad Model convention, held in Tokyo. The layout at JAM, and its track plan, are shown above. 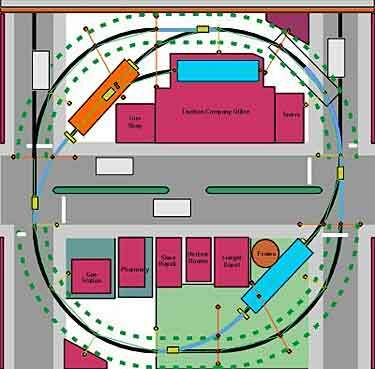 The operating plan is for a car or train to leave the stub platform, circle the line a few times, then take the reversing loop and, after a few more circles, return to the station. “The main idea,” says Rehsi, “is to enjoy driving the big trams.” He not only developed his own rails and track but also designed and built special rolling stock, including articulated mechanisms to negotiate the ultra-sharp curves. The result: a spectacular large-scale layout in a truly minimal space! 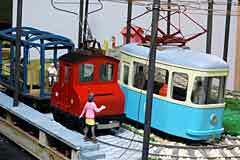 There’s much more detail about the layout and rolling stock at Rehsi’s website. You can get a translation at Google Language Tools. Jeff Law, from Tauranga on New Zealand’s North Island, is building this automated 550x550mm (21½x21½in) HO layout representing a TramWay Museum, thus allowing it to run a wide variety of trams. Shown in the photos are two examples from Jeff’s collection — a Melbourne M-class car (red and cream) and a Kato tram (tan) painted and lettered to represent a Hiroshima car presented to that city by the city of Hannover. 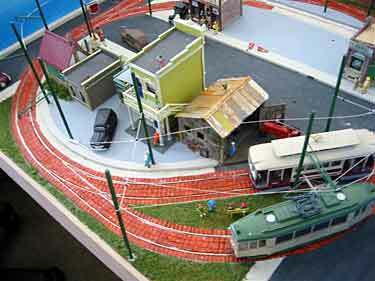 The layout is titled the Mike Rowe Tramway Museum (I think there may be a pun lurking in there somewhere). 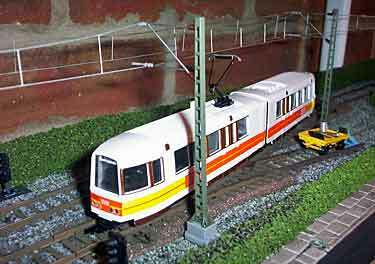 It features common-rail and live overhead wiring with fully automatic running using a PICAXE micro-controller. For more, see Jeff’s website. construction. Often we can learn a great deal from seeing how others build their projects. periodic updates as their layouts are expanded or completed, or add new and interesting details. This month we have some inspiring updates about layouts covered in previous issues of this Scrapbook. Paul Napier, from Wellington, New Zealand, originally built the Mt. Albert Tramway a few years ago. 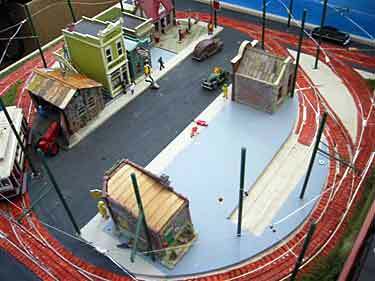 It’s a nearly foot-by-foot model of a real industrial two-foot-gauge tramway built and operated in Wellington to assist in building a new sewer tunnel beneath an existing residential neighborhood. 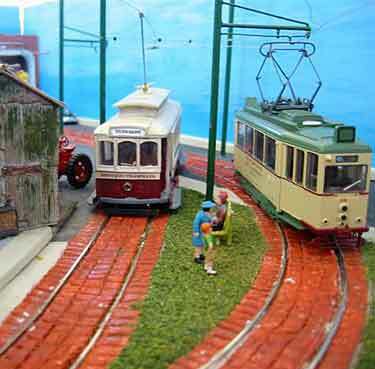 The tramway and Paul’s model were originally described in our Micro Layout Design Gallery. 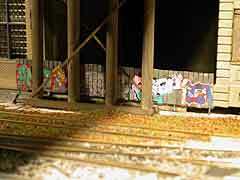 The scratchbuilt layout is 1:24 scale, running on 1-inch gauge. A unique characteristic of the line was its access to the underground workings — the trains entered through the cellar of a house! Paul modeled this entrance faithfully, and now has added a breathtaking “underground” section behind it! These photos convey some of the drama and excitement he’s built into this model. Talk about inspiration! 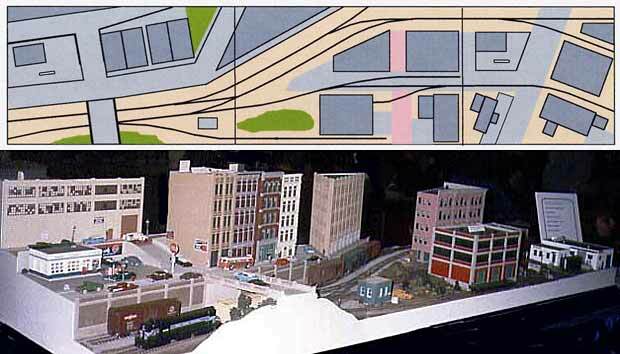 A LAYOUT GROWS ABOUT BROOKLYN… FROM 12,000 MILES AWAY! Prof Klyzlr’s model of Brooklyn: 3 AM centers on the intersection of 2nd Avenue and 41st Street. The only catch is that the Prof lives in Sydney, Australia … half a world away! Besides working on scenic effects that will create the impression of a rainy night in Flatbush (and which we’ll share with you when they’re ready), Prof Klyzlr continues to add details and authentic touches to the scene. He sent along the photos below as a kind of progress report. There’s more to come from this inspiring layout, which was featured in Scrapbook #63a. 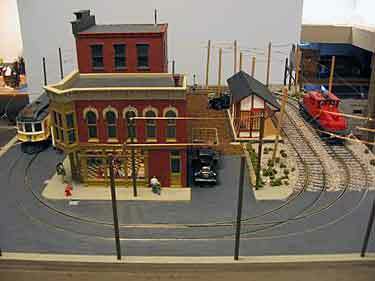 Moore’s Yard is an O-scale narrow-gauge layout being built by Brian Wilson, from Victoria, British Columbia, Canada. It’s been seen in Scrapbooks #53a and #55a. 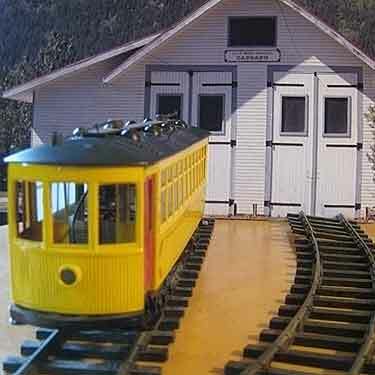 This dual gauge shelf line is also a perfect illustration of the habit that little extra-narrow-gauge trains have of “taking over” a layout. 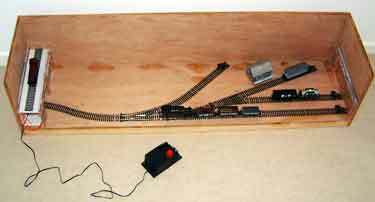 The On18 portion of Brian’s model started as a single spur with a sideline to the turntable (which is described in a FAQ). Now it’s virtually a self-sufficient railroad with a major portion of the shelf’s real estate! This photo shows one reason why: those little trains are cute! The Owner’s Coach is a new scratchbuilt model, just delivered to the siding behind the roundhouse. Bob decided to have his lunch there, and unfortunately his boss, Max, caught him at it! For more, see Brian’s website. Although Borough Road Sidings was just a paper plan when it appeared in Scrapbook #69, it is rapidly taking shape and substance at the hands of its designer, Dave Humphries, from Hailsham, East Sussex, England. Besides now having baseboards of ply, track all laid and pinned, and some stock and scenery in position, Dave also has created a story line for this tiny Inglenook layout located in the South East of England, set in the years just before the Second World War. Dave explains, “The vague notion is that the sidings are part of a much more complex industrial network… outwardly of a general manufacturing nature but secretly manufacturing munitions for the coming war. 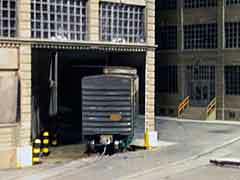 They are located at the end of a short line from the main complex and nestle between railway viaducts and industry of a less clandestine nature. There is some real-life justification of this as military industry was often carried on in works previously used for purely domestic engineering and production. Furthermore, it also gives me the opportunity for differing and seemingly unconnected wagons to be used, as during war-time military supply trains often used commandeered wagons or cars deliberately disguised as such. I have seen pictures of munitions moved in banana and fruit vans during WW2! Early versions of Heavy Traffic, an OO layout by Steve Grantham, from Bubwith, North Yorkshire U.K., have appeared in several previous Scrapbooks (notably #57 and #59a). You might find it instructive to see how the detailing of the layout has proceeded since this time last year. These current photos show the layout in its nearly-finished state … with details that can be added, but definitely in exhibitable condition (in fact, Steve exhibited it at York in April 2007). I finally did it … made a music video about a model railroad. 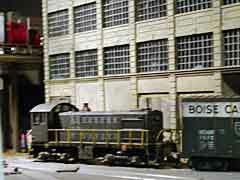 It’s called The Local Freight and is exhibiting now on YouTube. You can view it, if you’re interested, by clicking on the “Start” button (black triangle) on the screen below. Be sure to crank up your sound system before you start the video! 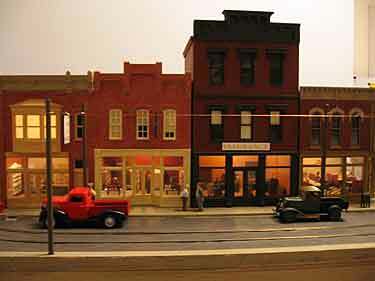 The layout shown was built by a talented modeling friend, Jim Sacco, who operates City Classics Models, a U.S. manufacturer of HO and N scale structure kits. Jim built this layout entirely on his own, in his spare time, to show off his City Classics kits. It was featured in Scrapbook #38a (including track plan) and has come a long way since then. 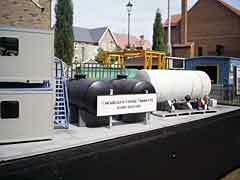 I had a chance to visit it a few weeks ago, while it was set up in Jim’s cellar for refurbishing between train shows. I was captivated and immediately pulled out the camera and started shooting. The results are shown here … a video update to the City Classics layout story.